While Store It America has many different size storage units, you’d be surprised how much you can fit into a 5x10 foot unit. This size is actually equivalent to a one bedroom apartment. Want to figure out how to make it all fit? 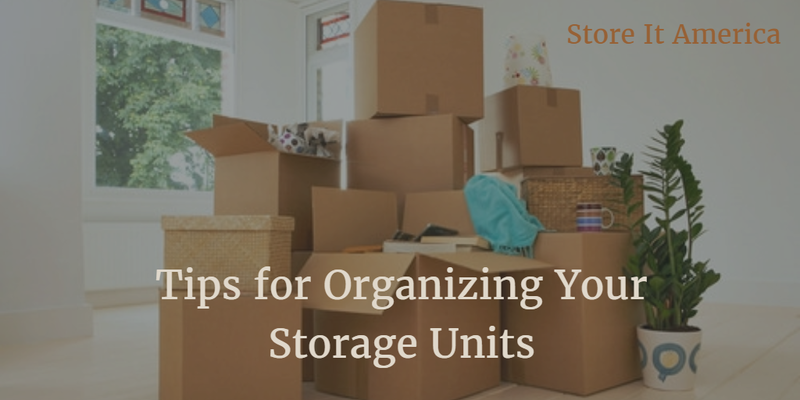 Before you start to get overwhelmed, take a deep breath and follow our packing tips to organize your storage unit. Accessing Boxes While In Storage: If you will need access to items in your storage unit while it’s filled, you’ll want to do some planning. This will help prevent you from rummaging through all of your boxes and totes when you need to retrieve a belonging. The items you will need access to the most should be packed in last and kept together in the front of your storage unit. Box Sizes: Try to keep your box size consistent. This will help when you need to stack boxes on top of one another. Keep in mind that while using large boxes may seem convenient because they can fit more things, transporting these boxes can be difficult. The weight in these boxes may break the bottom causing everything to drop out. Large boxes are also more difficult to remove when needed to grab something out of them, not to mention they are awkward to carry. Accessing Boxes in the Back of your Unit: Create a walkway when you place your boxes in the storage unit. This way, if for some reason you need something you’ve placed in the back, you don’t have to take everything out to get to it. Label the Boxes: Make sure you label each box! This is important! The more descriptive you are the easier it will be to retrieve items and the less hassle you’ll have when unpacking these items. Be sure to indicate what items are fragile, what room it belongs to, and details of the contents in the box. Keep Track of Your Belongings: Keep a list of everything in the unit. This will help when you need to find something in particular. If you have things labeled correctly, it should be a breeze. Taking Care of Fragile Items: Fragile items should be wrapped in bubble wrap, newspaper or even towels. Make sure you mark these boxes as fragile! Spacing: Make sure when placing your boxes and containers in the storage unit that you keep distance between your items and the walls. This will allow proper airflow. This will ensure your belongings safety with extreme humid conditions. Furniture: Break down furniture that you’re storing and stack as best as you can. Don’t forget to place a sheet or blanket between your items so your belongings don’t get scratched.